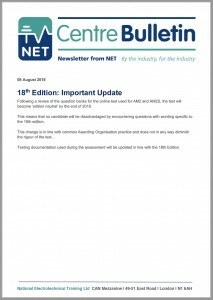 Following a review of the question banks for the online test used for AM2 and AM2S, the test will become ‘edition neutral’ by the end of 2018. This means that no candidate will be disadvantaged by encountering questions with wording specific to the 18th edition. This change is in line with common Awarding Organisation practice and does not in any way diminish the rigour of the test. Testing documentation used during the assessment will be updated in line with the 18th Edition.